DIAL: Black Dial with Heuer logo, silver baton hour indexes, white subdials, date at 6 o’clock. Silver hours/minutes hands with red tips and red central chronograph sweep seconds hand. Tachymeter bezel in black color, indicated as ‘TACHYMETER’. 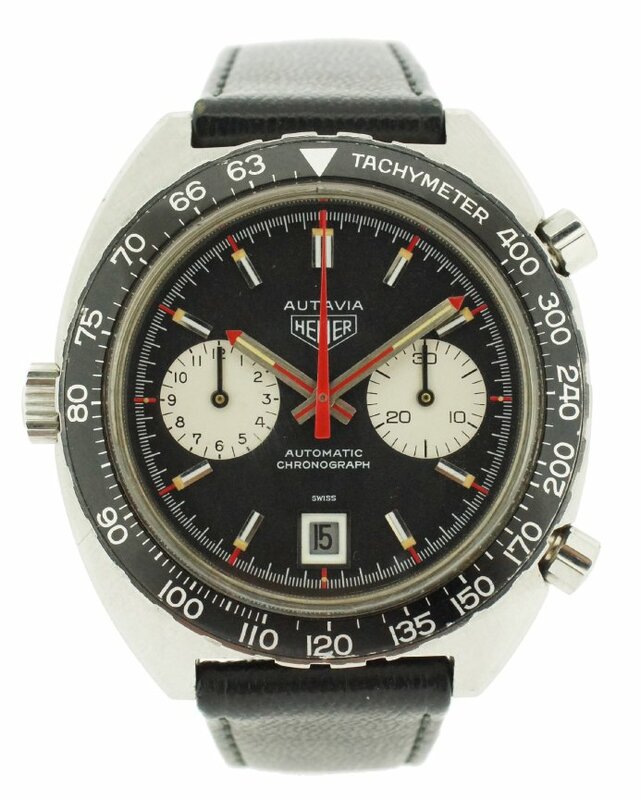 This Heuer Autavia 1163 ‘V’ is nicknamed the Viceroy as it was associated with the brand of cigarettes in the early 1970’s during a promotion that saw this model exclusively produced for the promotion. Cigarette adds for the Viceroy brand displayed race car drivers wearing the watch and a mail-in rebate that would allow to purchase the watch for $88 while the Autavia white dial and black dial with the hours/minutes rotating bezel were $200. This promotion was immensely successful in the launching of Heuer chronographs although it did not help the Viceroy cigarette brand. The 1960’s saw the race towards the development of the first automatic chronograph movement. Two groups were in contention for this feat: Movado/Zenith versus Heuer/Breitling/Hamilton/Dubois Depraz. The Caliber 11 was released just ahead of its competitor in March 1969 and became the first iconic automatic chronograph in the world.